She is either complicit in her husband's worst instincts or a victim of them, either struggling in an anachronistic job or confidently doing precisely what she wants to do with it. Fifteen months after she became first lady, Melania Trump remains a mystery. In the span of several days ending Tuesday, Melania Trump will have been thrust into a more visible public role than perhaps at any other time in her husband's presidency. It comes after a lengthy period of relative invisibility that has not only confounded White House tradition but also limited her potential political benefit to a troubled administration. After hosting the Japanese prime minister and his wife at Trump's Mar-a-Lago compound in Florida last week, Melania Trump attended the Saturday funeral of former first lady Barbara Bush in Houston; the president stayed away. Before the service she smiled and chatted with former President Barack Obama, whom her husband has scorned for years, and, again smiling, joined in a formal picture with all of the former presidents and first ladies who attended the funeral. Later that day, as her husband continued to rage at perceived opponents on Twitter, she released a statement reiterating support for the Bush family, which has been openly antagonistic toward the president. On Tuesday, two days before her 48th birthday, Melania Trump will preside over the first state dinner of the Trump presidency, honoring the president of France, Emmanuel Macron, and his wife, Brigitte. The delay in hosting a state dinner, an event usually held in a president's first year, had raised questions about Melania Trump's view of the job. The White House on Monday sought to underscore her central role by releasing a video showing the first lady picking out dishes and linens and orchestrating a luxurious tableau. White House Press Secretary Sarah Huckabee Sanders emphasized at the top of her daily briefing that Melania Trump "has taken an active role in every detail and planning of the visit." It should be no surprise that Melania Trump's tenure as first lady has been as unconventional as her husband's presidency. She delayed her arrival in Washington for five months, so their preteen son Barron could finish school in New York. Since coming to the capital, she has been buffeted by the president's controversies, most uncomfortably the multiple accusations of affairs during their marriage. She and Barron have been only sparingly seen compared with other first families. Yet if past first ladies were seen as largely apolitical, Melania Trump seems to have become a vessel for Americans' polarized emotions about her husband. "We still don't know that much about her and it seems like she intends to keep it that way," said Kate Andersen Brower, author of "First Women" and a second book about the inner workings of the White House. In the absence of a fully developed image, Melania Trump's actions have drawn outsize attention. In January, after allegations surfaced about Trump's pre-presidential affairs, Melania Trump suddenly canceled her participation in an overseas trip with her husband. She traveled separately to the State of the Union address at the Capitol on Jan. 30, and marched into the House chamber wearing a white pantsuit, a style evocative of women's suffrage and a totem of Hillary Clinton's campaign. The couple's anniversary on Jan. 22 and then Valentine's Day passed without any public recognition of their marriage. Yet when Japanese Prime Minister Shinzo Abe arrived at the Trumps' Florida home last week, the first couple strode hand in hand across the lawn to greet him. That yin and yang was reminiscent of the 2016 campaign. Melania Trump spurned the practice of modern political wives and barely campaigned for her husband. Yet when he needed it most — after the release of a video showing him bragging about assaulting women — she went on camera to defend him and said the controversy was "organized by the opposition." The role of first lady is often defined by staged events, such as the annual Easter egg roll, which Melania Trump has embraced. What she has done far less is serve as a political buttress. Amid Bill Clinton's impeachment crisis, Hillary Clinton was in heavy demand among Democrats campaigning for the 1998 midterm election, her own popularity soaring. When George W. Bush plummeted in popularity during his presidency, Laura Bush traveled the country in his stead, raising money for Republicans. Michelle Obama developed such a visible political presence that some Democrats begged her to run for president. Her emphasis on childhood nutrition dovetailed with her husband's effort to expand health care coverage. Tina Tchen, Michelle Obama's chief of staff, said of the relative roles of the president and first lady, "He's the elected official and anything we do should serve to amplify." She declined to address the Trumps specifically. At the same time, Tchen said, "You need to select issues and act in the role with things that are authentic to you." Anita McBride, who served as chief of staff to Laura Bush, noted that Melania Trump, unlike most other first ladies, did not come to the White House after a lifetime in politics. "Even the most experienced politicians ... will find it very difficult at first to adjust to the security, adjust to the schedule," McBride said. "I think she was smart to buy time for herself." Yet it is President Trump who seems to have affected his wife's ambitions the most. When she announced that a prime focus would be cyberbullying, Melania Trump cast it as an extension of her concern about children. "We have a real opportunity to teach positive online behaviors, but that also means addressing issues offline such as kindness, empathy and respect," she said. Her invocation of civility drew hoots from those critical of her husband's frequent forays into online mockery. Similarly, Melania Trump has spoken often about solutions to the opioid epidemic. "I'm proud of this administration's commitment to battling this epidemic," she said in New Hampshire in March, calling attention to a White House gathering of addiction experts. Her husband's record is more mixed. Trump has asked for billions to combat opioid addiction. But he also has slashed money for the office leading the battle and sought to cut Medicaid, which pays for much of the nation's drug treatment programs. Robert Watson, an American studies professor at Lynn University in Florida, who has written extensively about first ladies, said Melania Trump's background should be a strength — she is an immigrant, now an American citizen, who speaks several languages. But that too has been made problematic by her husband's broadsides against immigrants and his desire to retreat from global cooperation. "The first lady can be a secret weapon and ... Melania could soften his image," Watson said, but instead she has chosen so far to do "the absolute minimum necessary." 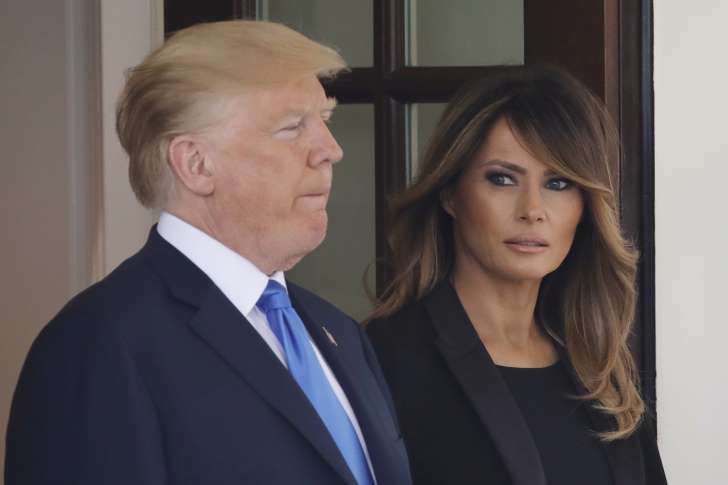 Ohio University historian Katherine Jellison said that while first ladies are almost always more popular than the presidents to whom they're married, Melania Trump may be tripped up more than most by the current " 'take no prisoners' political environment." "Trump critics can point to Mrs. Trump and say she's been an enabler or she's a victim of the Stockholm syndrome," Jellison said. "I think if she did have a more upfront role, in an effort to soften his public image, she'd come in for more slings and arrows. Part of the reason she is more popular than her husband is that she is lower profile." It's not clear if the week of activity will inspire a higher public profile or whether Melania Trump will return to the pace of her first year in office. "I think what we see now is what to expect the remainder of his time in office," said Jellison, who has studied first ladies. "We're going to see a woman who does not want to be involved politically much, and sometimes does not want to be in the fishbowl at all."